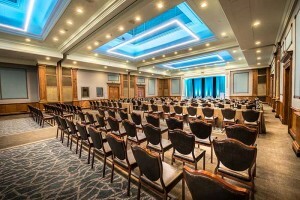 UK - Edinburgh-based Black Light has helped the world-famous Gleneagles Hotel revamp its flagship conference venue in time of the 2014 Ryder Cup. The project involved the installation of power, data, sound and lighting systems in the hotel’s Gleneagles Suite. This is Gleneagles’ premier event space and the location of many high-profile meetings and functions. "Our work was part of an overall refurbishment of the suite by designers Sedley Place," says Black Light’s Head of Company Development, Phil Haldane. "Our role was to help the designers create more flexible lighting and AV options for event organisers. We worked closely with the contractor, Stag Developments, and the main user, Catalyst Event Production Services to bring this project to fruition." The specific project brief was to install lighting and speakers, along with data, power and dimming channels that could be patched to the suite’s various zones. Black Light was also asked to install a lighting control system that was user friendly and which could automatically split the suite into separately controllable areas. The eCue system that the company’s installation team decided upon using has a tablet as a control interface. This allows easy control of light levels, colour control, theatre dimming channels, projector screens and cradles. According to Haldane, Black Light won the tender for the Gleneagles project because it could offer a very quick turn-around time. The project deadline was very tight (three weeks) due to the upcoming Ryder Cup tournament, which required the use of the Gleaneagles Suite. Black Light’s proposal was also more cost-effective and provided more flexibility and features than those offered by other companies. "The very short turn-around time created its own challenges," explained Haldane. "Given the global profile of the Ryder Cup, it was vital that we hit our deadlines and that schedules did not slip. This meant that we had to carefully plan our work and liaise with the other trades working on the project to ensure that the overall refurbishment went to plan." Black Light’s work involved system design, programming and commissioning. The company’s team also had to install specialist speaker and projection screen systems so that they fitted within the fabric of the building. All power, data and sound connections had also to be discreet yet accessible. Moreover, all systems had to be scalable for future events taking place within the hotel. "Our light and power installations mean that the Gleneagles suite is now better equipped for the high-tech requirements of event planners and users," says Haldane. "A wide range of lighting schemes can now be controlled via tablet and touch screens." Gleneagles is a world-famous 5 Star Luxury Hotel in Scotland. Set within 850 acres of beautiful Perthshire countryside, it is home to three championship golf courses, and was host for the 2014 Ryder Cup. © 1999 - 2019 Entertainment Technology Press Ltd.